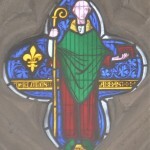 St Botolph was a Saint from East Anglia who died around 680,? it is now believed he built his church in Iken, Suffolk,where a church remains on top of an isolated hill. he converted the Middle Angles in 653 when under Ealdorman Peada they received the true faith.? Penda was the ruler of Mercia? who attacked East Anglia and Killed King Anna. King Anna was the Christian King who gave refuge to Cenwealh later to become King of Wessex, he was responsible for the baptism of Cenwealh and from this point all Kings of Wessex died Christians.? King Anna was succeeded in turn by his two brothers ?thelhere and ?thelwold and it was they who it is believed granted land at Ikenhoe to St Botolph.? There St Botolph began a monastic community based on the Benedictine way of life. ? In 970, Edgar I of? England and a member of the House of Wessex,? gave permission for Botwulf’s remains to be transferred to Burgh, near Woodbridge, where they remained for some fifty years before being transferred to their own tomb at the abbey of Bury St Edmunds, on the instructions of King Canute.? King Canute had killed many of the nobles of East Anglia in the battle of Assandun in 1016 including ?thelweard a Grandson of? ?thelstan Ealdorman of East Anglia.? The abbey of Bury St Edmunds was consecrated as a Benedictine Abbey on the anniversary of the battle of Assandun possibly as an act of reconciliation8. The present church at Swyncombe was built probably by Saxon workers under the command of the Normans. It is situated on the Ridgeway once a major road from Avebury in Wiltshire to the flint mines of Norfolk. Just prior to the Norman invasion the lands around Wallingford, including Swyncombe were in the hands of Wigod a staller to Edward the Confessor. Wigod seems to have been related to ?thelstan Ealdorman of East Anglia1 (Half King) who in turn may have been descended from Aethelred I 4,? elder brother to Alfred The Great.? ?thelstan was also Lord of Uffington and granted land to Abingdon Abbey. Once Harold had been defeated at the battle of Hastings Wigod allied himself with William as William sought to take control of the rest of England.? Wigods daughter married the Norman Robert d’ Oilly soon after the invasion and Roberts daughter and heiress Matilda married Miles Crispin a relation of Milo Crispin a monk at the Abbey of Bec and Gilbert Crispin Abbot of? Westminster. They were probably descended from Gislebert Crispin, Baron of Bec. The life of the founder of Bec Abbey (Vita Herluini) was written by Gilbert Crispin? 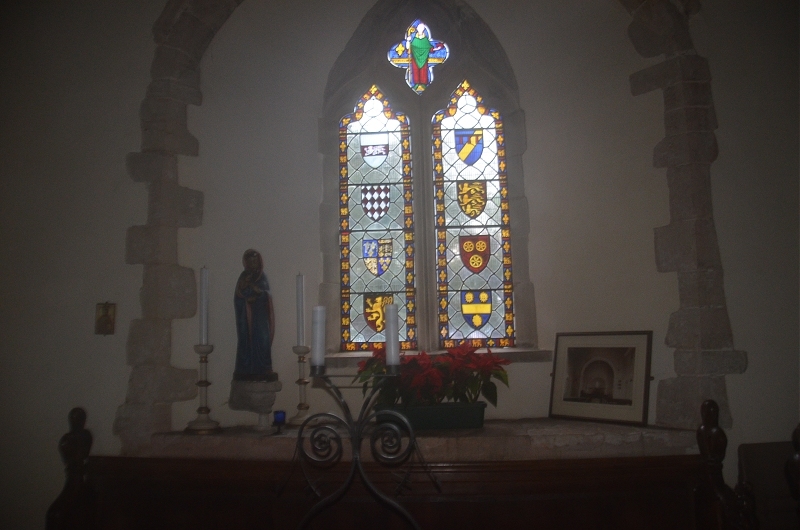 and the stained glass Window on the East side of Swyncombe church shows at the top Abbot Herluini the founder, indicating that in the early years of the stone church there were strong ties to Bec Abbey. 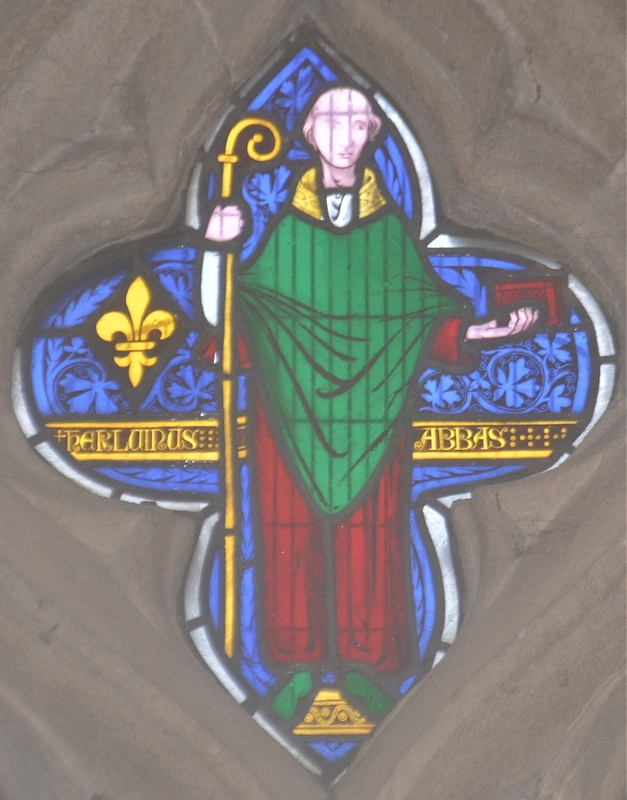 Abbot Herluini had been a Norman Knight at the court of Gilbert (Crispin) Count of Brionne who was also the father of? Richard Fitz Gilbert ( later called Richard De Clare? )7.? One possibility is that the Crispin family were cousins to Duke William of Normandy all being descended from Richard the Fearless first Duke of Normandy.? Emma of? Normandy was first,? the wife of? ?thelred II (the Unready) and then King Canute, she was also a daughter of Richard The Fearless and Williams claim to the throne of England came from this relationship. Bec abbey also received other lands in England including St Neots Priory in Cambridshire founded in 974 by Earl Aelric (or Leofric) and his wife Aelfleda (or Ethelfleda).? Leofric is believed to be the grandson of ?thelstan Ealdorman of East Anglia3, he would also have been stepbrother to ?thelred II through his mother.? St Neots priory was rebuilt around 1100 by Richard De Clare,? ( mentioned previously but now taking his name from Clare in Suffolk ) and Rohais Giffard his wife.? Rohais Giffard was probably the sister of Walter Giffard ( 2nd Earl of Buckingham son of the? Lord of Longueville ) after whom Crowmarsh Giffard takes its name.? Later Bec abbey? also received Goldcliff priory in Monmouthshire and the village of Tooting Bec now in London.? St Neot was a warrior turned monk in Cornwall who advised King Alfred during his campaigns against the Danes he may have been a relative of? King Alfred. Bec Abbey built a manor house at Swyncombe in the 13th century and the site has been occupied continuously since.? The house was rebuilt in the 16th Century and after a fire in 1814. It was also replaced circa 1840 and 1980.?? The church would have served many of the people around the Swyncombe area.? There was a nearby hunting Lodge at Ewelme park. The living, a rectory, was one of the poorest in the deanery, and few of its medieval incumbents were particularly distinguished. In the 14th century the advowson was confiscated by the Crown, and from the 16th century most rectors were presented by the Lord Chancellor on the Crown? s behalf. 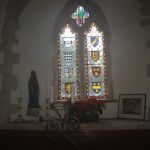 The Reformation caused considerable disruption, including a ten-year vacancy, and as in some other parts of south Oxfordshire Roman Catholic recusancy was encouraged during the 17th century by a resident lord of the manor, who maintained a private chapel. During the 18th century Roman Catholicism and Protestant Nonconformity waned, although a succession of absentee rectors failed to promote Anglicanism. That pattern was reversed in the 19th and 20th centuries, when the church was restored and the rectory house rebuilt by several long-serving incumbents. A High Church tradition was established, reflecting the parish?s changing social character, although a Primitive Methodist chapel was also well supported. The benefice remained independent until 1997, when it was taken into a team ministry based at Watlington. 4. C. R. Hart, ‘Athelstan “Half King” and his Family’, Anglo-Saxon England 2, (1973), 138-43.